In January, 2016, Raytheon | Websense became Forcepoint LLC. In this release all TRITON graphical user interfaces have a new look and feel. The colors and logos, as well as the logon screen and most toolbars, have been updated to reflect the Forcepoint brand. These changes do not affect product functionality. Over time, branding will be extended to other areas, such as the Help system, as well as to external content, such as the Knowledge Base. You can upgrade directly to 8.2.0 from any version of 7.8.4, 8.0.x, or 8.1.x. For upgrade instructions, see the V-Series Upgrade Guide. Those upgrading from v7.8.4 and earlier need to know that version 8.0 introduced a new, simplified product naming and grouping of the TRITON product line. Existing product functionality is unchanged. Appliance product names are unchanged. This will tell you if you have a V10000 G3 appliance. However, for V10000 G2 and V5000 G2 machines, the summary does not indicate whether the appliance is an R1 or R2 model. When you connect to any TRITON management console—TRITON Manager, V-Series Appliance Manager, and Content Gateway Manager—you are presented with a self-signed certificate. 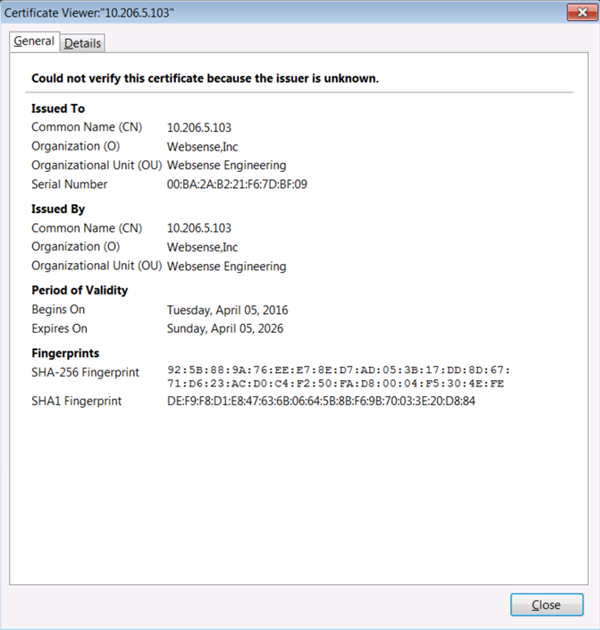 The certificate names Websense, Inc., as the Organization (O). This will change to Forcepoint LLC in a future release. Because browsers do not recognize Websense, Inc., as a known Certificate Authority, a certificate error is displayed the first time you launch a TRITON management console from a new browser. To avoid seeing this error, install or permanently accept the certificate in the browser. After the security certificate is accepted, the manager logon page is displayed.